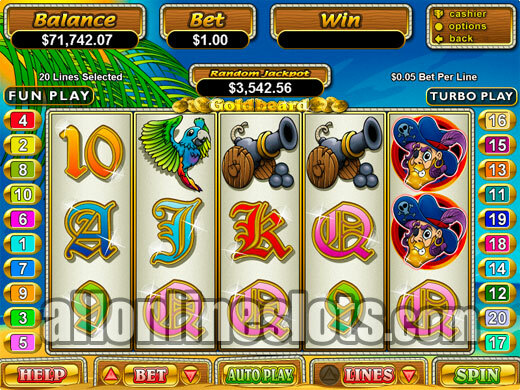 Goldbeard is an RTG video slot with a pirate theme. It has stacked wilds on reels 1 and 5 which not only substitute for other symbols they also trigger the free spins. During the free games extra stacked wilds are added to reel three. 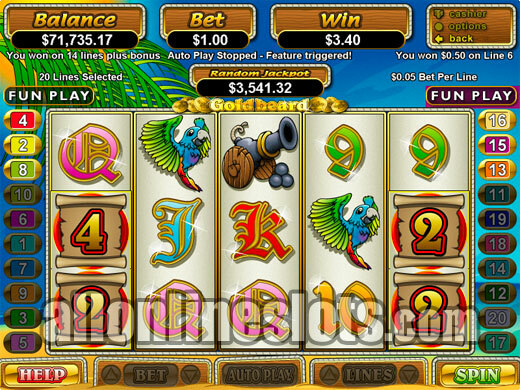 If you like the Australian style video slots, Pokies as they call them then Goldbeard is well worth a look as it has some great features. It has 5 reels and 20 lines, comes in a range of coin sizes and offers a great free games bonus feature where you can win up to 15,000 times your line bet. The game has a pirate theme with the Gold Beard symbol being the most important. Other symbols that relate to the theme are pirate ships, cannons, parrots, treasure chests and gold coins. Like all Australian style games the rest of the symbols are made up of card values ranging from ace to nine. The Gold Beard symbol only appears on reels one and five during regular play but it does tow things. Firstly it is wild for all of the other symbols and double any win it is a part of. 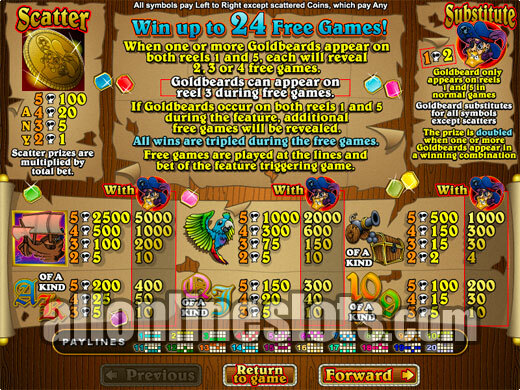 Secondly the Gold Beard symbol activates the free spins. Unlike most slots that have different symbols above and below each other there are sections of the first and last reels that have groups of the wild Gold Beard symbol. This means that you can get an entire reel of wilds at both ends of the game. Get at least one at each end and you win the free spins. Each Gold Beard symbol then reveals a free spin amount between 2 and 4 free games. This can be up to 24 free spins if you get the whole set. On the free spins the wild symbol can appear on reel three which makes getting those big five symbol combos even easier. The bonus can be re-triggered and to make things more interesting all wins are tripled. The highest jackpot is 5,000 coins for five pirate ships with at least one wild. This is followed by 2,500 coins for the five ships with no wilds and then by five parrots with a wild which hits for 2,000 coins. Five scatters also awards 2,000. Gold Beard comes in a good range of coin sizes starting at just one cent so you can be spinning for the jackpot for as little as 20¢ per game. Overall a great video slot with a unique way to win the free spins.